We do our damnedest to stay up on the best new apps, but sheesh, the mess of options drives even nerds like us batty. We teamed up with our friends at Wired to put some order to the sprawling madness. The App Guide is available today on newsstands, Wired.com, and of course, as an iPad edition. Inside we've boiled the hundreds of thousands of available apps to the 400 best—including everything from time-burning games to productivity-improving tools. You're welcome. 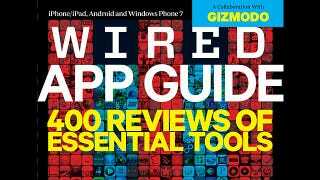 This week we'll be featuring content from the app guide on Gizmodo—but there's oodles more so head over to Wired.com or pick a copy up for yourself. To kick it off, here's Brian X. Chen's essay "The Numbers Game." The big three mobile players are constantly bragging about the insane quantity of apps they have. Here's why it really matters. There's a reason Apple, Google, and Microsoft continue to brag about the mind-boggling numbers from their app stores - 425,000, 250,000, and 30,000 available apps, respectively, and billions sold. At the start of any new platform war, quantity trumps quality. That was the case for the videogame console wars of the 1990s. In May 1995, Sega of America launched the Saturn, the first 32-bit videogame console in the US, several months ahead of schedule. In the face of aggressive marketing from rival Sony for its forthcoming 32-bit PlayStation, Sega decided to get a head start on the competition. One problem: There were almost no games. The Saturn was a superb piece of hardware, but because of the fast-tracked release, game developers, who were still trying to figure out how to code for the Saturn's dual-core processor, didn't have their titles ready. This caused widespread frustration for both developers and gamers and saddled the console with a poor brand image. Though the PlayStation was nowhere near first to market, it came out on schedule in late 1995, trailed by the Nintendo 64 the following year. A sizable library of titles accompanied each. Developers and consumers felt comfortable getting on board, and by ‘97 those two consoles were battling for supremacy. Sega quietly discontinued the Saturn in ‘98. Similar scenarios have played out throughout the tech world over the past few decades. Companies with better hardware or that came to market first lost to competitors who simply had more content: Betamax fell to VHS, HD DVD to Blu-ray, and, on the desktop, Apple to Microsoft. Once the numbers reach a critical point, developers and consumers put their money where it will be best spent, and the platforms' fates are sealed. Apple doesn't expect you to look at more than a tiny fraction of the App Store's 425,000 titles. When you think about it, even the relatively low 30,000-app count for Windows Phone 7 is huge. But those numbers symbolize platform security: "We're not going anywhere." At some point, though, quality becomes more important. If a company doesn't quickly and consistently back its numbers with smart user experiences and ongoing improvements, it opens the door to more innovative competitors. This is tech, after all; no lead is secure. MySpace once surpassed even Google.com and Yahoo Mail as the most visited website in the US. It had the numbers. But the company began ignoring quality and innovation and started layering on ads, especially after News Corp. acquired it for $580 million in 2005. Despite arriving much later, the initially ad-free Facebook offered a better social experience. And every few weeks it would push out new tools and options - games, instant messaging, application widgets. The established platform stumbled, and the superior one took over. The big battle now, obviously, is between iOS and Android, though Windows Phone has secured a foothold - partly through innovation but mostly because of the numerous developer partnerships Microsoft has by virtue of its massive win over Apple on the desktop. In fact, this three-player structure could be a sign that the mobile industry has transitioned from an unsettled upstart to a more established force. As an industry matures, mergers and bankruptcies frequently lead to a ruling triumvirate surrounded by a few minor players. In the US auto industry, it became Ford, General Motors, and Chrysler. In aviation it's United, Delta, and American. In the smartphone world, it's iOS, Android, and Windows Phone. They've got the numbers to prove it. Brian X. Chen is a former reporter for Wired and the author of Always On: How the iPhone Unlocked the Anything-Anytime-Anywhere Future - and Locked Us In. The App Guide is a joint venture between WIRED and Gizmodo, two old friends who like to make awesome content together; it's available on newsstands all over creation, on Wired.com, and in iPad app form.